If you follow my blog on FB, you will know that my Mother arrived a couple of weeks back. 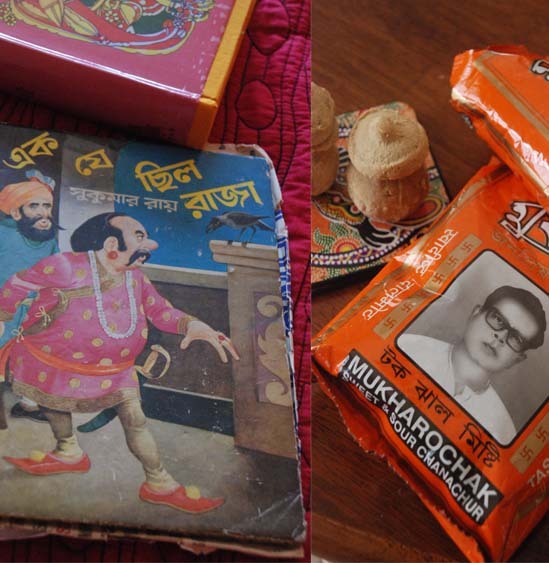 With her of course came packets of Mukhorochak chanachur-- tauk--jhaal-mishti -- sour--spicy-sweet. And loads of books. Tons of Enid Blytons for the 9 yr old, Bengali story books by Sukumar Roy from my childhood for the little one and fat Lila Majumdar Rachanabolis for me. A natural fallout of all these books is that I have been engrossed in reading and have had little time to do anything else during free time. And there in an FB status, I heard that people these days don't like free time, as they have no idea what to do when there is nothing to do. Anyway, I have no such problems. I am an ardent Lila Majumdar fan and have been one for the last 30 years. I can read her stories and essays over and over and yet find new joy every time in the tales of uncomplicated times of simple livings. The downside of reading such great authors is that I myself feel very incompetent and my writing feels bleah ! So, I take the easy way out and read more, hoping to learn something but eventually only get engrossed in the tales. When I get time away from reading, I make Dal er Bora. And also take showers. 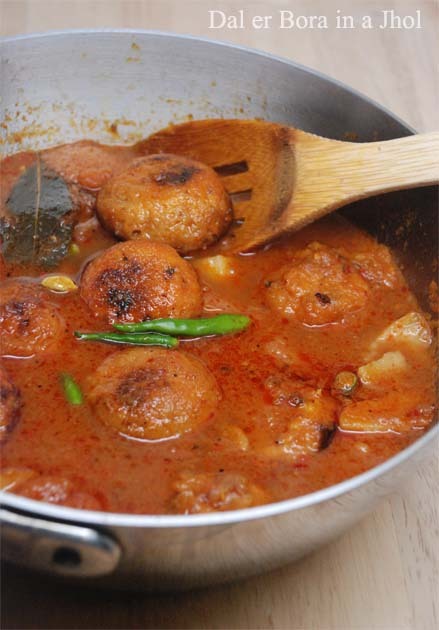 Now, the Dal er Bora or Lentil fritters is a very typical Bengali dish. There are lentil fritters made throughout the length and breadth of India for sure but these particular ones are typical to Bengal. They are also deep fried and very different from the sun dried lentil fritters-- the bori. I had written a detailed post on the Dal er Bora some years back. That one was made with Matol + Musur Dal. This time I did not have any Mator dal and so used only Red Masoor. Also different from the jhaal-jhol last time which needed mustard paste, I made a Borar Jhol this time, which was more in the lines of a dalna like this Alu Potol er Dalna. I also added few of the boras to a thin jhol with vegetables and spiced with mustard paste, like this Alu Begun er Jhol. Both the dishes tasted very good. Bengali vegetarian dishes are vast and varied but very few non-Bengalis know that. One of the oft heard comments I have received from non-Bengali readers of my book, is the surprise on the Vegetable chapters. As this particular reader says about my book "But it has to be said, the book has opened my eyes to the breadth and depth of Bengali cuisine, which in my severely myopic view did not go beyond macher jhol, mangsher jhol, and the indiscriminate use of badly chopped (sometimes whole) potatoes and of course mustard oil." Now honestly, the variety is too much for me to even know, forget putting in the book, but I hope as we dig out these simple gems, more people will be able to enjoy Bengali food beyond maacher jhol and kosha mangsho. and make a smooth paste. Beat the lentil paste with a fork till everything is well mixed up. In a kadahi, heat Oil for deep frying. When oil is hot, scoop the paste with a tablespoon and drop it in the bubbling hot oil. Fry till the lentil fritters are brown and crunchy. Instead of deep frying, I made the fritters in an ebelskiver pan aka appe pan. 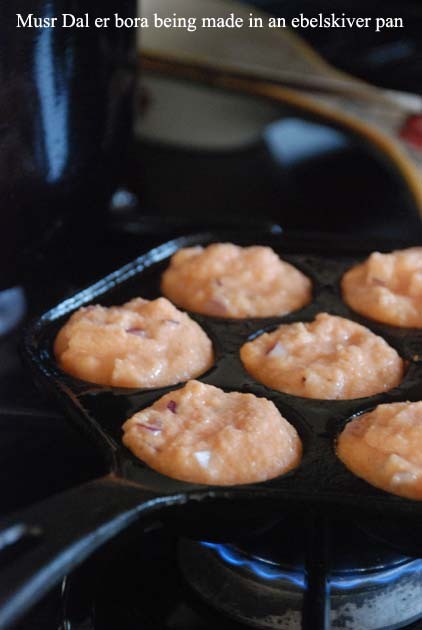 You can follow the instructions in this post for making them using the appe pan. Take 2-3 peeled whole tomatoes from a can or 1 big juicy tomato and blend to make tomato puree. Add the tomato puree to the pan. Note: usually Jeera powder is used but I added Bhaja Masla. Sprinkle a little of the tomato juice or a little water and fry the spices for about 5 minutes. This is called "kashano" in Bengali or "bhuno" in Hindi and a lot depends on this step. You need to fry the masala till the oil surfaces and the masala takkes a deep red color. Don't try to hurry it. I have done that and there has been a difference in taste. Add 1 cup of warm water. Add salt and sugar to taste. Cover and cook till potatoes are done. Now add the fried dal er bora/lentil fritters. Let them simmer in the gravy at low heat for a few minutes. The bora soaks up the gravy fast so add more water to the gravy if necessary. Taste the thin gravy to see if it tastes right and adjust for spices. Add a touch of ghee at the end to up the taste. Serve with rice. Let your next book be "Niramish Bong Cookbook"! You deserve it. I've always enjoyed your writing immensely, S. No worries about competing with the 'greats' as I am sure you're great in the eyes of your readers! Just looking to the pics i am hungry and greedy. Wow I am so jealous your mom is there with you. Have a fabulous time with your mom. Have a lovely time with your Ma. 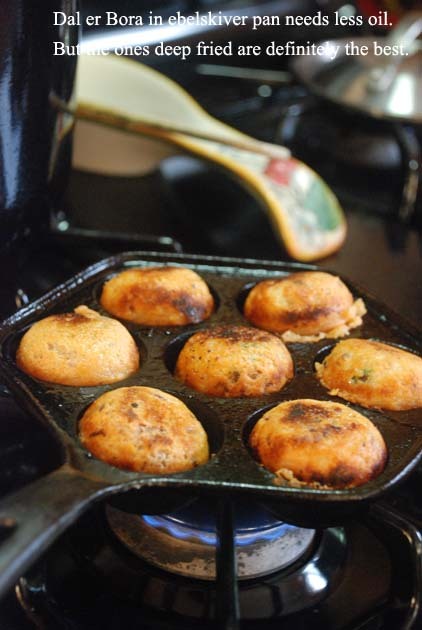 the ebelskiver pan is good for certain things, like the Paniyaram. But when it cmes to making boras & bhajiyas, it makes more sense to stick to the good old karahi for deep frying...much easier & much less messy, & the results are more delicious & better looking. I recently bought one of these pans for just this reason! It has not yet been initiated - now it will be. Please share more recipes using this pan or how to use it as an option to deep frying. I made this last night for dinner and it was very well received by both the husband-an as well as my nine year old son. We have a similar dish in Eastern U.P. made from masoor/moong paste that we steam instead of frying and it usually gets eaten as a snack with green chutney, although there is the option of pan frying it after steaming as well. 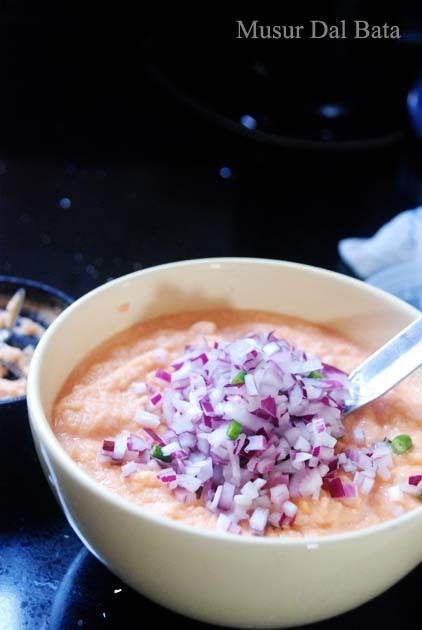 How pretty the masur dal paste looks with those raw onions in it. And your first photo is great too! You are a lucky Mom as your daughter reads books given by her grandma. When my daughter was nine the only Enid Blyton she would read ( listen to while I read to her ) was Noddy as she could see it on TV. As she got older she read Harry potter ,Twilight series etc but refused to read Enid Blyton. When I came to the U.K about 5 yrs back I was surprised to see very few Enid Blytons on the shelves. Instead there was a folder there with a list of books children read in the sixties & guess what! I found Enid Blyton's name in there. Great recipe! Very interesting use of pakoras in a gravy instead of the usual use as snacks or in kadhi! I tried this recipe and loved it.. Only issue was somehow all the liquid got absorbed and it became like a dry curry. It was so tasty nobody cared it was not as it was supposed to be. Simply Superb! Thanks for sharing. Here is my post on the same. Do check it out. too much masala. taste much better with just panch foron, bay leaft, turmeric, red chili, green chili and cumin powder.